Specialty: Semiconductor company designed, developed, maunufactured and marketed specialized semiconductor memory. Developed low-power, low-density FeRAM "FRAM" ferroelectric nonvolatile random access memory,and high-speed Enhanced-DRAM "EDRAM" products, for use in automotive safety systems, entertainment systems, portable medical devices, industrial process control systems, smart electricity meters, and consumer electronic devices. 1984 Ramtron founded for basic ferro-electric Research and development. 1988 Newtech Development Corp. changes its name to Ramtron International Corp.
1988 Ramtron announces its first practical FRAM memory chip at the ISSCC show in San Francisco in February, the FMx801. 1992 Ramtron opens there first ferroelectric fab online at 1.0 um. 1992 Ramtron was the first company to introduce ferroelectric technology in commercial memory products beginning with a 4 kilo-bit parallel interface product. 1993 Introduction of first commercially available FRAM product 512x8. 1995 Enhanced Memory Systems, Inc. "EMS" becomes subsidiary of Ramtron operating there EDRAM business. 1996 Ramtron Kabushiki Kaisha "Ramtron K.K." becomes a subsidiary of Ramtron to perform sales & marketing functions with there Japanese alliance partners. 1998 First FRAM foundry established with Rohm Electronics at 0.8 um (now closed). 1999 Ramtron becomes fab-less semiconductor company. 2000 Fujitsu establishes 0.5 um FRAM production. 2001 Ramtron begins manufacturing collaboration with Texas Instruments production lines in Dallas, Texas. 2003 Fujitsu establishes 0.35 um FRAM production. 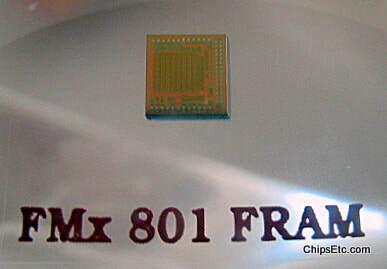 2005 Ramtron introduces 1Mb FRAM. 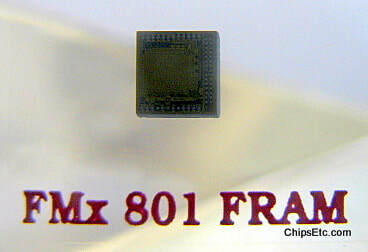 2007 Texas Instruments establishes 130 nm FRAM production. 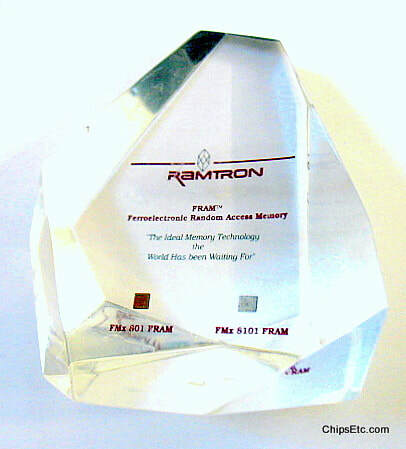 2007 Ramtron introduces first 4Mb FRAM production. 2009 Ramtron enters into a foundry services agreement at IBM's Burlington, VT. based wafer manufacturing facility, using .18 um CMOS. process. 2010 Fujitsu manufacturing partnership with Ramtron ends. 2012 Ramtron begins manufacturing collaboration with Rohm Co., Ltd production lines in Japan. 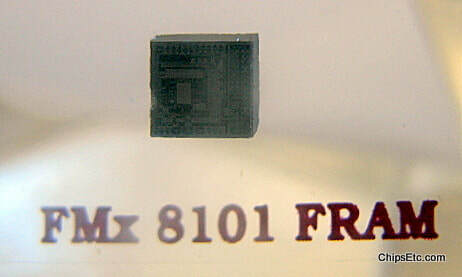 Ramtron FMx 801 FRAM, a 256 x 1 bit CMOS ferroelectric RAM memory chip. The FMx801 was essentially a vehicle to `prove' FRAM technology in practical production, rather than a device intended to displace current memory chips. The FMx801 was Ramtron's very first commercial product. In February 1988, one month after Newtech changed its name to Ramtron, the company announced its first practical FRAM memory chip at the ISSCC in San Francisco. 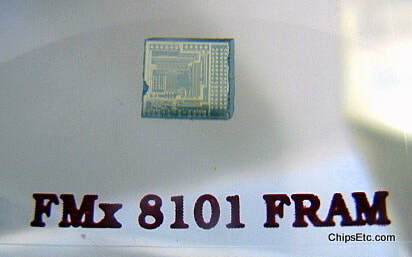 Ramtron FMx 8101 FRAM, a 256 x 1 bit bit Ferroelectric Random Access Memory chip that was developed by Ramtron, also as a demonstration vehicle. FRAMs are non-volatile read/write memory devices which incorporate ferroelectric materials such as Rochelle salt, barium titinate, and lead titinate that can retain a permanent electrical field after being induced by a transient external voltage. FRAM memory advantages were: Fast write speeds, Very high write endurance, and Low Power Consumption. Ramtron F-RAM memory chips were designed for applications that require high data integrity and ultra-low power consumption. These products target markets were automotive, industrial, enabling technologies, and networking. F-RAM inherently features high endurance, fast single-cycle and symmetrical read/write speeds, along with low energy consumption, gamma radiation tolerance, and immunity to electromagnetic noise. Ramtron competed with much larger memory chip makers including SGS-Thomson, Motorola, Hitachi, Dallas Semiconductor, Atmel Corp., Microchip Technology Inc., Xicor Inc., Rohm, and Benchmarq Microelectronics Inc. 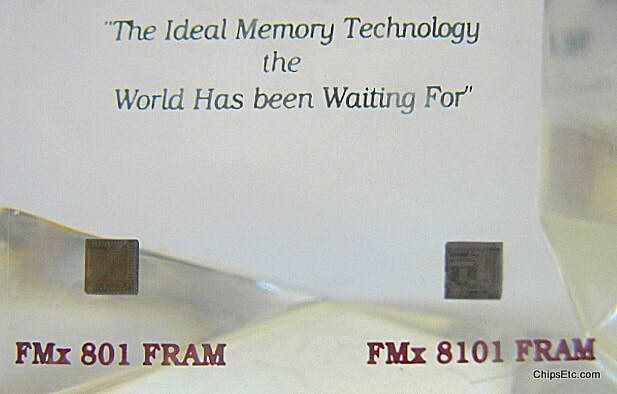 Reads "FRAM, Ferroelectronic Random Access Memory, The Ideal Memory Technology the World Has Been Waiting For". ​Measures 4" wide x 2.5" deep x 4" tall.